Last year I published a blog post about seven real things to fear on Halloween. I’ve been thinking about what makes my dry skin crawl this year, and uncovered seven more real things to fear as we celebrate the spookiest day of the year. Eagles are still dropping eels. After I wrote about the man who was innocently eating a sandwich in his car when an eagle dropped an eel on his windshield, I heard from a friend who experienced first hand the macabre fixation of our national bird. She had just had her roof shingled when an eagle dropped an eel on the pristine asphalt. She had to rake it off and it was not exactly intact if you know what I mean. You can be sure she did a rain dance imploring nature to wash away imbedded eel parts. Ewwww! Dogs are still driving: Two pups left in a car with the ignition running to keep them air-conditioned while the owner dashed into Walmart shifted the car into gear and took a joy ride. Unfortunately, instead of heading into the Old Roy section of the store to stockpile biscuits they hit a concrete pillar. 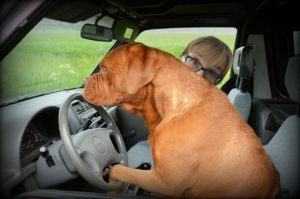 Should Cesar, the dog whisperer, now include a DVD for doggie driver’s ed? Becoming my Halloween character: In April Patrick and I attended a gala dressed in formal wear. A young man I didn’t recognize approached me and said, “I know you. 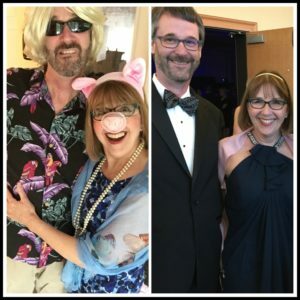 You came with your grandsons to our house last Halloween dressed as Miss Piggy!” I’m not sure if it was the outfit that tipped him off or my obsession with the hors d’oeuvres. I could have totally understood if he had recognized Patrick. 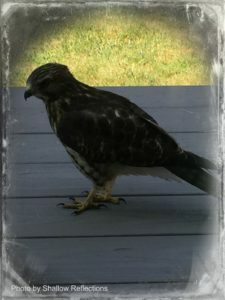 Pigeon hawks: I was typing a blog post one day when a bird with an enormous wingspan crashed into my window with its face contorted into an angry sneer. I screamed, “A bird is trying to kill me!” A google search revealed its identity as a pigeon hawk and it came to roost on the deck before flying into the trees to hunt rodents. My self-esteem is still trying to recover from the fact that it seems to be hunting me. Breaking my glasses: When you can only make out general shapes from 3 feet away without your glasses, the thought of breaking them instills terror. I have four extra pairs and trust me when I tell you this is cheaper than training a service dog. Especially if it totals my car while I’m shopping at Walmart. Permanently rolling my eyes into the back of my head: There are so many things that prompt an eye roll these days, and an election year magnifies this by a million. I had a fright when they stayed rolled back for 7 minutes, which inhibited my compulsion momentarily. Until I focused in on another campaign ad, that is. Clowns: No matter which side of the political fence you are on, I think everyone agrees there are have been some clown sightings on the campaign trail this year. And I am afraid. Very afraid. What has you shaking in your Halloween costume this year? I haven’t completely unraveled yet, but I’m a-frayed at the edges. Is this an example of knit-wit, Bill? The election has me plenty scared, as in “to this we’ve come” scared. I still have faith we can withstand the results, Kathy. I may be living in Canada but I think we’ll be okay.